By using HDFC debit card we will get 1% cash back per each transaction. The CB amount will shows in Reward Points. Each Reward Point is equals to Rs.1/-. We will redeem those points by logging into HDFC Online Net Banking. Customers who are not register in HDFC Bank Online Internet Banking here we will explain how to signup in HDFC Net Banking Registration Process. 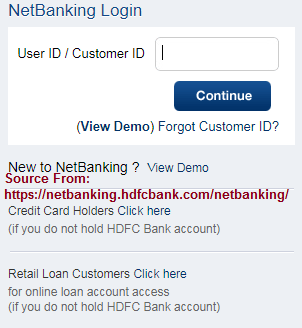 Till now who are opening a new account in HDFC Bank those customers can get Net Banking by default in the kit. Now we will discuss who are not signup in online banking those customers should follow the below instructions…. Click on “Register for NetBanking by generating a One Time password ( OTP)”. In the next page it indicates write your Customer ID as printed in your Passbook. Click on GO button. You can get One Time Password it will be send sms to your registered mobile number within the bank. If you not receive the OTP again regenerate it. Enter the OTP click on submit button. Actually “Customer ID” is the Username for your Internet Banking Login. In the next step you can choose “IPIN or Password”. Password must contains Alphabet, Alphanumeric and atleast one special symbol ($ or _ or @ or – etc). Click on Submit Button. It is completed successfully. Customers who are using smartphone the HDFC officials will launch a Android or iOS or Windows App named as “HDFC Bank”. Install in your smartphone. In Mobile Banking app you can get these facilities like Account Statement, Account Summary, Balance Enquiry, NEFT, IMPS Transfer etc.